An important function of our Department is to help unions conduct national boycotts that have been endorsed by the AFL-CIO Executive Council. The Department maintains and publishes the “Don’t Buy” list of companies being boycotted and the products and services involved. In addition, you can see information on boycott updates. A company and its products or services are put on the national list of AFL-CIO-endorsed boycotts at the request of affiliated international and national unions that are working to help the firm’s employees overcome management efforts to keep them from winning justice on the job through organizing and collective bargaining. A boycott is endorsed by the AFL-CIO after it has been initiated by the international and/or national union as part of a broader campaign on behalf of employees of the targeted company. 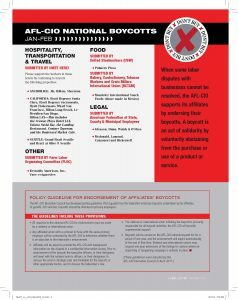 As appropriate, the AFL-CIO and the Union Label & Service Trades Department assist the international/national union with publicizing the boycott. The union retains the primary responsibility for conducting the boycott. Companies,their products and services are added to and removed from the list as events warrant. 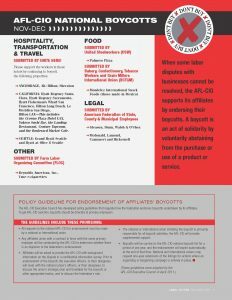 The AFL-CIO Executive Council has developed policy guidelines that regulate how the federation endorses boycotts undertaken by its affiliates. To get AFL-CIO sanction, boycotts should be directed at primary employers. Any affiliated union with a contract in force with the same primary employer will be contacted by the AFL-CIO to determine whether there is an objection to the federation’s endorsement. Affiliates will be asked to provide the AFL-CIO with background information on the dispute in a confi dential information survey. Prior to endorsement of the boycott, the executive offi cers, or their designees, will meet with the national union’s officers, or their designees, to discuss the union’s strategic plan and timetable for the boycott, or other appropriate tactics, and to discuss the federation’s role. 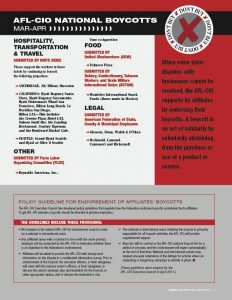 The national or international union initiating the boycott is primarily responsible for all boycott activities; the AFL-CIO will provide supplemental support. Boycotts will be carried on the AFL-CIO national boycott list for a period of one year, and the endorsement will expire automatically at the end of that time. National and international unions may request one-year extensions of the listings for actions where an organizing or bargaining campaign is actively in place. This includes the Crowne Plaza Hotel LAX, Yokoso Sushi Bar, the Landing Restaurant, Century Taproom, and the Boulevard Market Cafe. REYNOLD’S AMERICAN INC., Vuse e-cigarettes. MONDELEZ INTERNATIONAL Snack food products labeled “Made in Mexico” including Oreos, Newtons, Chips Ahoy, Honey Grahams, Animal Crackers, Ritz Crackers, Premium, Belvita, Lorna Donne, Teddy Grahams, Honey Maid, and Wheat Thins.